Technologies enrich and impact on the lives of people and societies globally. Society needs enterprising students who can make discerning decisions about the development and use of technologies, develop solutions to complex challenges and contribute to sustainable patterns of living. Technologies can play an important role in transforming, restoring and sustaining societies and natural, managed and constructed environments. At Merredin College, we strive to encourage and develop enterprising individuals who can make discerning decisions about the development and use of technologies. We also encourage students to work both independently and collaboratively to develop solutions to complex challenges and contribute to sustainable patterns of living. Technologies students are often required to plan and manage their work in collaborative settings, and are assessed through creative design tasks which test students’ capacity to investigate, generate, produce and evaluate. Merredin College has in place excellent infrastructure for providing students with access to current technology. 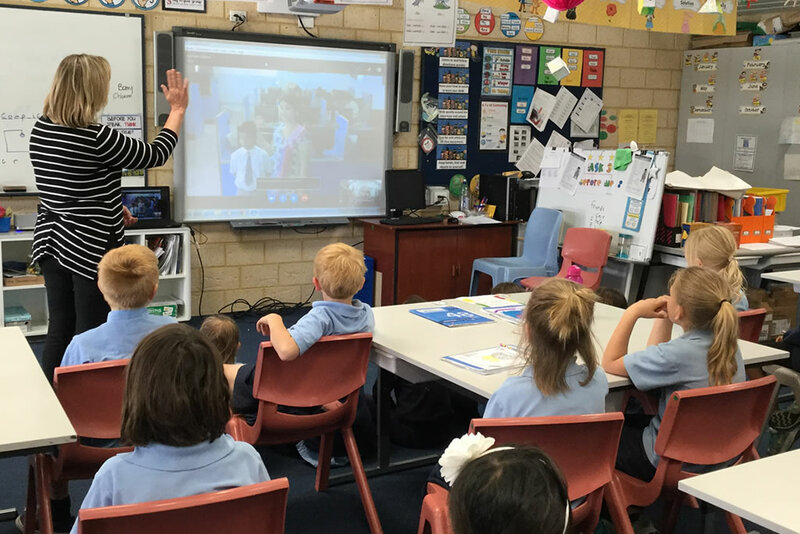 The Collgar Community Fund generously provided laptop computers to set up a computer lab for Kindergarten – Year 6 students in 2015. This is a well used resource. Kindergarten – Year 6 share a trolley of iPad minis which provides one-on-one access for each student. Junior primary classes have access to programmable ‘Beebot’ robots to support the development of coding skills and Year 3 – Year 6 students have access to ‘Dash&Dot’ robots to further develop these skills. Classroom teachers use ‘Seesaw” to share student driven digital portfolios with parents so that they know exactly what their child is producing in the classroom. The use of green screens has also become increasingly popular. We have a scope and sequence to ensure skills for using technology are taught sequentially, including keyboard skills, and we are embedding the teaching of coding into this sequenced program. In Digital Technologies students are provided with practical opportunities to use design thinking and to be innovative developers of digital solutions and knowledge. Digital Technologies is a subject that has a specific curriculum and includes the practical application of the Information Communication and Technology (ICT) general capability. In Design and Technologies students learn about technologies in society through different technologies contexts (Engineering principles and systems; Food and fibre production; Food specialisations; and Materials and technologies specialisations) as they create designed solutions. Throughout Years 7 and 8, Technologies’ students study 10-13 weeks of Digital Technologies, and 10-13 weeks each of agriculture, home economics and woodwork from the D&T subject. In Year 9 when students have a deeper understanding of their skills and interests, they then choose two contexts from Technologies. Once in Year 10, students select in-depth courses in their preferred discipline areas. At this stage it’s important to select carefully in preparation for Years 11 and 12. Students in Year 7-9 study sustainable farming practices with an in-depth look at the plant growth processes, chicken farming, and innovative gardening practices. Agriculture classes aim to give students an understanding of the world around them and how current farming practices are trending towards a sustainable future. Students are able to develop their awareness of farming practices whilst getting a hands-on approach that has real life application. Creating solutions through collaborating and evaluating. Home Economics provides students with an opportunity to explore the areas of textiles and cooking. Students plan, prepare, produce and evaluate a range of nutritious meals while learning how to confidently use multiple sewing machine functions to produce practical fabric designs. Woodwork provides students with an opportunity to explore the material qualities of wood. Students design and produce a number of different products while learning how to safely and confidently use tools and machines for a variety of woodworking processes. Students studying Year 10 metals will be given an opportunity to use a variety of hand and power tools safely and fabricate a variety of small metalwork projects. Students will be able to develop an awareness of the properties of different metals, the methods of cutting and joining metals following set procedures. Diagnostics and Virus detection and protection. Operating software applications and creating user documentation.